The client for this weekend home on Lake Chickamauga near Chattanooga, Tennessee has been fascinated with lighthouses since purchasing this waterfront property at a bend in one of the lake’s well-traveled feeder creeks. He has asked that the functional lighthouse include a living space, a bedroom and bath and a study. The property slopes steeply up from the waterfront construction site, making land access difficult. The lighthouse theme is achieved by stacking the programmed spaces in a three story, tapered, nine square-grid structural frame. The living space and guest bath are located on the first floor, the bedroom, bath and private deck are on the second floor and the study occupies the top floor. The lighthouse’s rooftop cupola is open to the third floor. 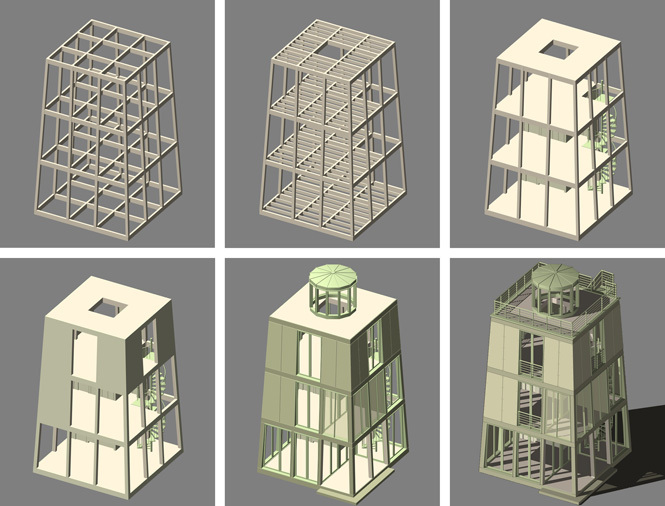 To minimize the use of water barge deliveries, the lighthouse is designed to be constructed of prefabricated components that can be delivered to the site in one shipment. These components include timber posts and beams, insulated wall and roof panels, metal windows and concrete panel sheathing.